The heavy-duty Lexmark MX611DE MFP is perfect for medium sized workgroups with high-volume printing needs. It has a monthly duty cycle of 150,000 pages and aside from printing, the Lexmark MX611DE laser multifunction printer can also scan, fax, and copy. It has a standard memory of 1,024 MB that can be upgraded to 3072 MB and it is integrated with a powerful 800 MHz processor. The fax machine has a modem speed of 33.6 kbps. The MX611DE multifunction printer is quite pricey. Users will have no trouble operating the Lexmark MX611DE monochrome laser printer with its large and user-friendly 7-inch touchscreen display on the control panel. For connectivity, USB and Ethernet ports are offered and the Lexmark MX-611DE is compatible with Linux, Windows, and Macintosh computers. This device weighs 52 lbs and measures 22.1 x 19.3 x 18.9 inches. The MX611DE mono multifunction printer has a flatbed scanner and an ADF. For paper handling, it has a standard input of 650 sheets. Black Lexmark MX611DE cartridges have a maximum capacity of 20,000 pages. The Lexmark MX611DE printer can handle a wide range of media and it offers finishers. This device can help save time and effort with its high paper handling capacity and quick print speed of 50 ppm. Users can expect high-quality output from the Lexmark MX611DE MFP printer. With built-in Ethernet, this device is easy to share. 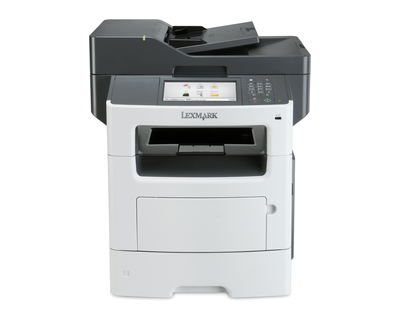 Some of the handy features of the Lexmark MX611DE workgroup printer include an automatic duplexer and a USB host. More users would be able to access the Lexmark MX611DE mono laser MFP if it had Wi-Fi. Running costs are affordable but the same cannot be said with the multifunction printer's initial cost.